Before Contacts can provide your contact information to Apps and phones, you must upload it. This is done using the CSV upload function. This is part of the Contacts-Admin App which is ticked in the list of Apps in the Config Admin template. 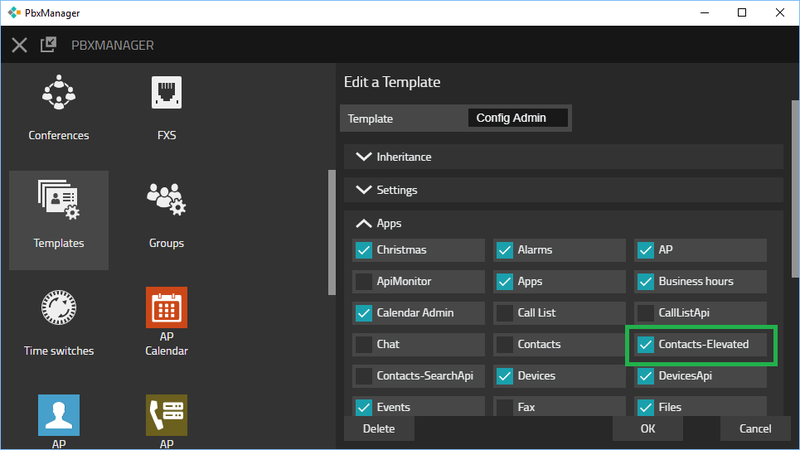 While we are at that: there is also the Contacts App in the list of Apps which is ticked in the Config User template . This App is nearly identical to the Contacts-Admin App except that it does not allow the import of contact information. 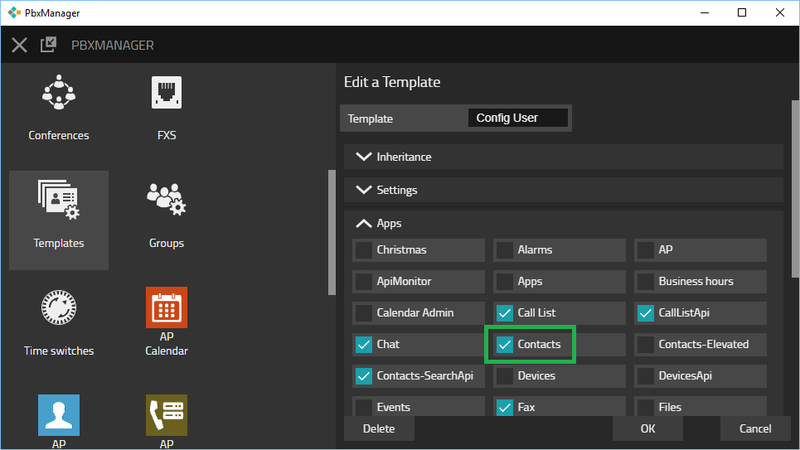 As we have seen before with other Apps, Contacts also has an API that allows other Apps to access contact information. This is known as CallListApi in the list of Apps and it is ticked in the Config User template so that all users have access to it. Add the Contacts-Admin App to your home screen and start it. Searching for names does not make sense at this point as there are no entries in the database yet. An input file for Contacts is basically a semicolon (;) separated CSV file. The following lines contain the contact data and must have the same column order as the first line has. The order of the columns does not matter as long as all lines follow the same order. Also, you can remove entire columns (from both the header and the data lines). This is a quite familiar file structure known as comma separated values (CSV) file. However, one thing makes it a bit difficult: its content must be encoded as UTF8. This is why our sample file uses file extension .utf8. If you can handle this, it is the format to go with. However, if you think you could easily open and edit this with Excel, then the answer is No, unfortunately not. The reason for this is that Excel expects the file to be encoded differently. If you try to open it with Excel anyway, you will see that the names look strange in parts. Newer Excel versions (2016 and up) can handle UTF8, but it is less than obvious. Many people do prefer using Excel however. This can be done using a real Excel file where the contact data is maintained. We provide it as contacts.sample.xls. You can download it to your computer. This file (should be compatible down to Excel 97, we tested it down to Excel 2010) can be edited as usual with Excel without any encoding hassle . However, you can't upload the file to Contacts. Instead, when you're done editing in Excel, you would click in the Save as UTF8 button which creates an UTF8 CSV file version of your excel file. You can then upload this file. The first lines (before the empty line) are considered column headers. You can use Excel's hide row function to hide the header rows in the languages you are not interested in (and also the first line that contains the technical column headers we talked about before). You could even remove these lines, except for the first line and the empty line that follows the header lines. We therefore recommend to rather hide the lines so you do not run the risk of accidentally delete the wrong ones. If you do not need a column, you can either hide or delete it. You can even re-order the columns to better suit your needs. Outlook can export contact data to a .csv file. However, it also does not use UT8 and besides that, the export process is tedious and slow. When you maintain your contacts in multiple sources (for example, you have an Excel file per department), you can upload the data with multiple uploads. When you upload a file, Contacts will first remove all existing contacts which had been uploaded from a CSV with the same file name. So when you maintain several files with different names, you can upload some of them individually without doing harm to contacts that originate from another file.